George Wang (left) and his chemistry teacher Fazlur Rahman (right). Wang discovered carbon atoms can make more bonds than scientists previouslythought. 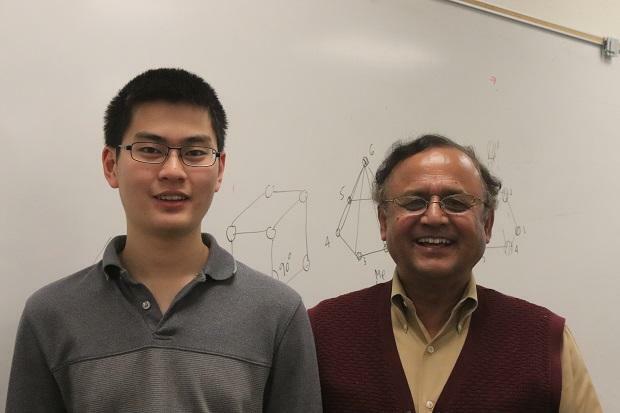 George Wang, a senior at the Oklahoma School of Science and Mathematics, recently made a discovery that disrupts a fundamental theory in chemistry. StateImpact's Emily Wendler reports on high school senior George Wang's discovery. He’s modest, and little shy about his finding, but Fazlur Rahman, his chemistry teacher at the high school in Oklahoma City, is ecstatic. Wang’s discovery came about because his teacher asked him to think outside the box. Rahman was teaching about the carbon atom, and its natural tendency to form four bonds, which he says is basic chemistry. But then Rahman introduced a scientific paper — published in 2016 by a German scientist — that says in exceptional circumstances, the element can form six bonds. Rahman says it was kind of a sarcastic question. He didn’t expect a high school student to one-up a German scientist from one of the country’s best universities. Wang, however, was motivated by the challenge. He was in his junior year at the time and had just learned to use a supercomputer lab in Norman. He figured, why not use it to tackle the carbon bonding question? First, though, he checked the German scientist’s work. He wanted to know: could carbon really form six bonds? Wang says it checked out: “It turned out that it was in agreement with the paper,” he said. So, next, he tried for seven bonds. As far as Rahman can tell, this is the first time anyone — anywhere — has ever discovered a stable, seven-bonded carbon atom. The teacher admits he was skeptical at first and asked to see Wang’s calculations. But Rahman says he’s not an expert on this kind of chemistry, so he asked Bin Wang, a chemical engineer at the University of Oklahoma, to guide George through the rest of his discovery. Bin Wang helped George Wang check and interpret his calculations, and publish a peer-reviewed paper about the discovery in a scientific journal. Since they published the paper just two and a half weeks ago, Bin Wang says he’s gotten many calls and emails about it — including one from that German scientist who discovered carbon could form six bonds. Bin Wang says the scientist wants to try and make this seven-bonded carbon atom in a lab. If that happens, it might find use in a plastic-making process — or storing hydrogen. But according to Bin Wang, there’s another reason the paper is getting so much attention: Its lead author, George Wang, is a high school student. Rahman, George Wang’s chemistry teacher, agrees. “I think people will think that this kind of idea should come out of Harvard, MIT, Caltech. And it came from George Wang, who is literally 18 years old,” he said. Rahman says Wang is exceptionally smart and self-motivated, but he also says young people, in general, are often naturally more curious and fearless in their pursuit of science. He says there are probably lots of other kids in Oklahoma, and across the country, teeming with the ability to do great things — they just need the right support and learning environment. Wang is about to graduate from the Oklahoma School of Science and Mathematics. He’s headed to Stanford University in the fall, but says he’s not quite sure what he wants to study. He’s considering chemistry, math, physics and computer science. Whatever he ends up pursuing, he says he already has ideas about inventing technology that could streamline teachers’ daily workload — giving educators more free time to tackle big questions with their students. And if he does develop it, Wang says he’ll bring the teaching tech back to Oklahoma.